Gratitude and trust. That’s something I’ve been mulling over these last few days. It’s difficult to be grateful or trusting when you are ill or when your finances are unstable or life is going totally in the opposite direction to what you had planned. How can we be grateful for things that don’t seem to be going well? Or an uncertain future?That’s precisely where trust comes in. Trusting that all things work for our good – knowing that the Universe is conspiring to ensure that what happens to us is for our best! The last two weeks have been a good test for me to see if I can keep an attitude of gratitude when ill. I’m afraid I really threw it out of the window when I was ill and my husband who was worse needed my help. Trying to run house, take care of and walk the dog, look after Jose and myself – that took all of me and I often grumbled. Jose tells me I was acting as if he was faking an illness. Gratitude fail! By the time, I was completely down though, I managed to pull up my ‘gratitude socks’ and even if my body complained, my soul was grateful! Give thanks for unknown blessings already on the way! I’m grateful that I’m on the road to recovery from the ‘flu. I’m grateful for my parents who sent us food through the last two weeks. Also for family that we could call upon when we were ill.
For Vidya who enquired about my health every day and who pitched in with posts on Write Tribe at short notice. For all the books I have access to and that kept me busy through the last few days. For our maid who has been so diligent about her work. Thankful that I don’t have to request anyone for leave. I can rest when I want to without feeling any guilt. 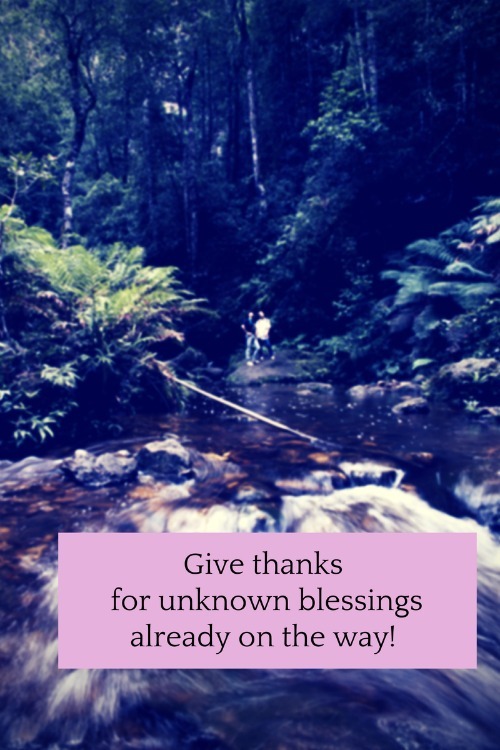 I’m giving thanks for unknown blessings that are already on their way! Today, I am also sharing with you about Gratitude and Trust – a book I received from NetGalley in exchange for an honest review. 1. Something needs to change, and it’s probably me. 2. I don’t know how to do this but something inside me does. 3. I will learn from my mistakes and not defend them. 4. I will make right the wrongs I’ve done whatever possible. 5. I will examine my behavior on a daily basis. 6. I will live in love and service, gratitude and trust. You can receive Gratitude and Trust in your inbox. Sign up here. Do you think gratitude and trust are interconnected? Hard to be grateful when you’re ill, but you pulled it off and that’s admirable, Corinne. Glad to know you and your hubby are on the mend. Oh yes, it is difficult, Debbie! Thankfully, we’re both doing much better. Thank you!